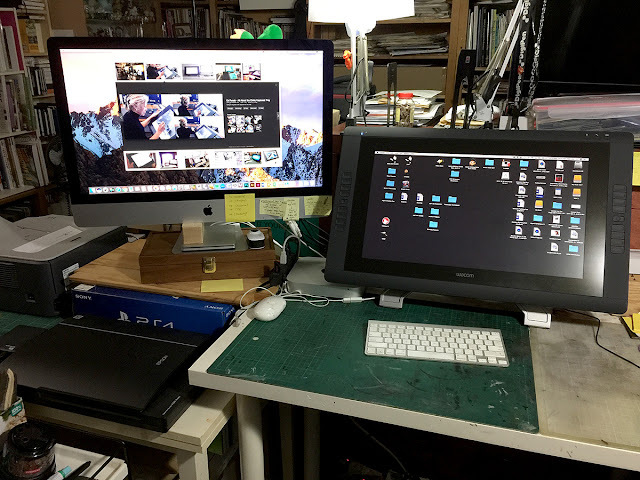 I would like to introduce my new Digital Drawing and Painting Setup. Basically, after pondering for more than 10 years, I felt that the time is ripe to purchase for myself a Wacom Cintiq to help me with drawing and painting digitally. I have using the Intuos setup for the longest time since when I started digital art back in 2000. My first tablet is a 12"X12" Intuos 2 which was slightly too large for me at that time. Before I went to US for my studies, I gave it away, and I have seen it since. I am also not sure what my friend did to it too. Anyway I am hoping the tablet has been put to good use, even if it is not at the moment, it has served me well many years too. When I acquired an iPad Pro, I was delighted (I have mentioned that for the umpteenth time in this blog and on my Facebook). It has definitely changed the way we draw on the iPad. Not just drawing, but note taking too. I googled for Note Taking App and tons came up on my search result. After sketching and painting for more than a year, I thought to myself, maybe I should also upgrade to a Cintiq. I have thought of it many years back. Used Cintiq in school as well in some office. Somehow, I felt that the technology back then wasn't cut for it. The drawing surface just got too warm for comfort. Resolution wasn't that fantastic too. Finally, when Cintiq 22HD Touch was launched I felt it was right. After watching reviews after reviews on Youtube I finally succumbed to the urge to get myself a Cintiq. It is a lot of money so I have to ask my wife for permission. And she agreed. Well, she always agrees to my whims and fancies all the time. So here's my latest studio setup. On the left is my iMac which is about 3-4 years old. Then in the middle the newly acquired Wacom Cintiq 22HD Touch. To the right of the drawing screen are my analog drawing materials which I really have a hard time organising them. I am bad in organising stuff. To the extreme right is my painting easel which can be tilted at any angle. This arrangement of the tools was inspired by pictures and studio setup found on the Internet. At the spur of the moment. Before that I cramped everything on one desk which made it hard for me to reach out to the mouse and keyboard. Beside my iMac, I have my Epson scanner beside the PS4 box (yes! I have a PS4) and Brother printer behind. This current arrangement leaves plenty of space on the desk. I could then roll the Cintiq out flat to draw more comfortably. I could also stationed my Cintiq this way so I could have lots of table space to draw by the traditional ways too. The cutting board makes it easy to use the knife too. 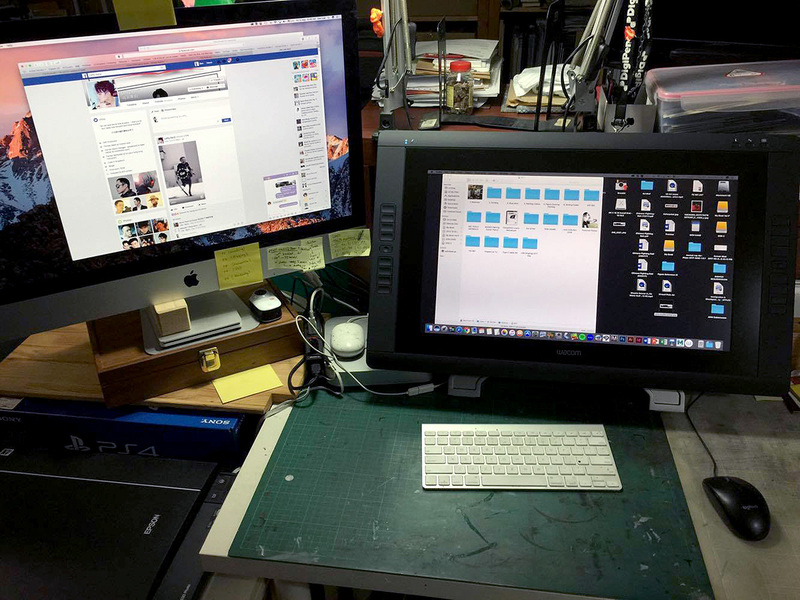 The iMac would double up as a secondary monitor when I am need to draw from reference. If I am drawing and writing at the same time, I would move the browser window to the iMac. 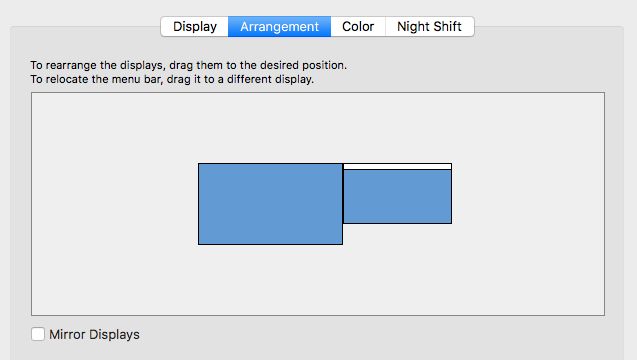 From the screen grab above, you would tell that I have placed the iMac and Cintiq according to how I placed them physically. The larger screen which is the iMac is placed on the left, whilst the Cintiq is on the right. Why is this important? Just so you can move the mouse in the right direction. Remember to turn the "Mirror Display" option OFF.